Science has been unable to clearly define common sense. Philosophers choose to avoid the phrase, because of its lack of precision. Yet people understand the idea of common sense. The Buddhists seek to achieve a common sense view, enhanced with compassion. This article defines common sense as the undefiled output of the prefrontal region of the brain. It is one person's calm and nonjudgmental view of the world. It is not a “commonly held view” as suggested by the dictionary, because what is common sense to one person can be stupidity for another. A common sense view integrates all the information available to one person into a single unemotional perception. With more information available, the common sense view of another person may be different. Following its evolutionary development, one of several parallel intelligences, including the prefrontal regions, take independent charge to control the mind. Information flows through several recognition stages in the brain. The prefrontal regions play a role in the global evaluation of data. 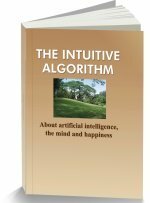 Intuition follows an either, or logic to hand over control to one intelligence. Intelligences in the limbic system have only limited access to the knowledge of the mind. An intuitive decision making process switches control between intelligences. Common sense requires stilling of the anger, fear, grief, envy and jealousy emotions. A state of pure perception empowers common sense. A common sense judgement is a purely personal view. Paul D. MacLean proposed a triune brainconcept to suggest three evolutionary stages in the development of the human brain. The initial mechanical responses evolved further to emotion controlled behaviors and finally culminated in the output of rational human viewpoints. Hunger and thirst, or territorial rights controlled the first stage reptilian brain. Social emotions such as guilt and shame controlled viewpoints for the second stage mammalian brain. In the third human stage, amplified cortical regions enabled a purely rational evaluation by the prefrontal human brain. All these systems operate in parallel. In an intuitive decision making process, one of these control systems takes charge and sets the viewpoint of the mind. Common sense emerges, when the prefrontal brain is in control. The flow of nerve impulses traced by science point to progressive integration of information by the brain. Increasing meaning is derived from information as it flows from sensory perceptions to the final stages of evaluation. The primary areas of the cortex receive sensory information. This information proceeds to secondary areas, which coordinate binocular vision and stereophonic sound. This integrated information travels to the association regions, which enable you to recognize objects and events. Typically, the somesthetic association region recognizes objects through touch. When that region is damaged, a patient cannot recognize a pair of scissors, when touching it with her eyes closed. She can still feel the scissors. Other regions recognize events through taste, sound, light and much more. The assembled recognition images proceed to the prefrontal regions, enabling you to make final sense of the whole. That is the common sense view. Unfortunately, the more primitive limbic system intervenes to narrow that vision. The role of the prefrontal regions has been noted by science. Many years ago, prefrontal lobotomy was applied for patients with intractable pain, or to modify the behavior of severely psychotic patients. The procedure isolated the prefrontal regions by cutting its nerve fiber links. Most patients were able to return home and even resume their former activities. The results of these operations were widely published. A significant outcome of this procedure was that the patients appeared to lack judgment and were tactless in social relationships. The general view of science is that these regions play a role in the global evaluation by the mind. People understand that common sense acts with tact and judgment. Science has held that all regions of the mind participate in mental activities. As such, how can common sense be the output of a single region of the brain? 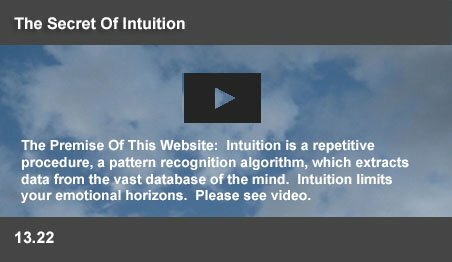 This website suggests that intuition is an algorithm, which narrows down answers by inhibiting irrelevant information. An animal cannot afford to pause undecided whether to quench thirst, or satisfy hunger. In every decision making process, intuition selects a single strategy from among many – common sense, anger, fear, guilt, envy, etc. In the early developments of the reptilian and mammalian brains, nature developed mechanisms to categorize incoming information in terms of emotions, including fear, sadness, disgust, contempt, curiosity, surprise, love, pleasure, embarrassment, guilt, and shame. Each emotion focused the behavior of animals into a single strategy – fear impelled the animal to avoid danger and anger to attack an opponent. In order to impel a focused response, the nervous system inhibited “irrelevant” information. Fear had no access to knowledge of previous successes. Anger was blind to past kindnesses by an opponent. Thus emotional viewpoints were blinkered and lacked the integrated view of common sense. In the competition for the control of the mind, an intuitive decision making process hands over control of the mind to the most powerful emotional signals. Science discovered that the limbic system responds within 20 milliseconds, while the awareness of the prefrontal regions appear after 300 milliseconds. Thus you become angry, before you realize that you are angry. In the process, emotions dominate human behavior, making common sense rare. This website offers a few Mind Control Tips to still emotions and pass control to your common sense. The following paragraphs show how the stilling of emotions can empower your common sense. They show that emotional viewpoints generally lack common sense. An absence of negative emotions defines common sense. Overt anger blinds you to the problems faced by your opponent. Many people have a hidden anger towards authority, or against a cruel fate for some self perceived inferiority. The emotion makes people impatient with mistakes and errors, or contemptuous of people. In positions of power, such people become harsh, or patronizing and condescending. Hidden anger often justifies itself by covertly inducing self failure. Such people generally know the error of their behavior, but anger impels them on. Such anger can be stilled through anger management. When their common sense is thus empowered, they will be able to accept the frustrating foibles of the world and act with kindness and consideration. Andy Grove suggested that only the paranoid survive. But fear tends to paralyze. Every vista appears dangerous and threatening. Creative management requires alertness, not fear. Pangs of fear can be stilled through self awareness and a few mind control practices. When fear is stilled, the awareness of danger will still be present. But the ability to take calculated risks and make a project successful will come to the forefront. Common sense appears, when fear is stilled. When life deals you a severe blow, it is but natural to feel sadness and to dwell on the images of “what might have been.” A reasonable period of grief is needed for a person to come to terms with traumatic changes in life. But, it is necessary to gradually forget the past and to plan for a new future. As grief subsides, common sense will take over, motivating the mind to get on with life. Envy and jealousy are triggered by the pain of failure. A neighbor's shiny new car can be a painful reminder of overdue mortgage payments. A bright new recruit to the office may be seen as a threat to the chances of promotion. An acceptance of one's own shortcomings can still these debilitating emotions. When your own failures are accepted, common sense can motivate you to avoid those failures in future, or to go out and seek new opportunities. The logic of intuition suggests that the human mind always enacts a single course of action, inhibiting other points of view. Can the mind isolate a purely rational view from its myriad emotional viewpoints? People have inbuilt prejudices, which may negate common sense. The Buddhists have practiced over centuries the art of stilling emotions through meditation and self awareness. They claim to have reached a stage, where “you will see the color or the sound as it is - you will not see something is good or bad, whether it is a beautiful picture or a very ugly picture, a sweet sound or an ugly sound. When you act like this, your mind will stay calm.” Evidently pure perception, without emotions is possible. The prefrontal regions have massive links to the limbic system, which controls emotions. Common sense may be a calm view of the world, with an awareness of emotions, while remaining unhindered by their blinkered views. The dictionary defines common sense as “a sound and prudent judgment based on a simple perception of the situation or fact.” But such judgment varies between people. Your judgment depends on the information available to you. So, a common sense viewpoint is not clearly definable, if it is considered to be common to all people. It is neither “a sense of common things, nor a sense of things common to humanity.” It has no consistent set of propositions. It does not follow rules of reasoning, or mathematical logic. Common sense is one individual's “sound and prudent judgment based on a simple perception of the situation or fact.” Intuitive logic suggests that common sense is the pure unemotional perception of one person's prefrontal brain.